Mountains, lush green trees, clouds, tents and a good company! Is it in your bucket list 2018? Add it to your fur ball's bucket list too and go on an adventure with your pet!! Have you registered yet? Have you heard about the upcoming trip by Tails On Trails?? These amazing bunch of people are up for some trekking in the hills WITH YOUR PET!! Yes, you and your pooch can join them for a trek to CHANDRASHILA on 9-11 March 2018 for a fun weekend which is surely going to be a memorable one! Why do we associate with them you ask? Because they do not pursue it for commercial interests, rather they donate all the proceeds from the trip to our FRIENDICOES. So come be a part of this noble cause! P.S- you may tag along even if you don't have a pet, just need to be an animal lover! 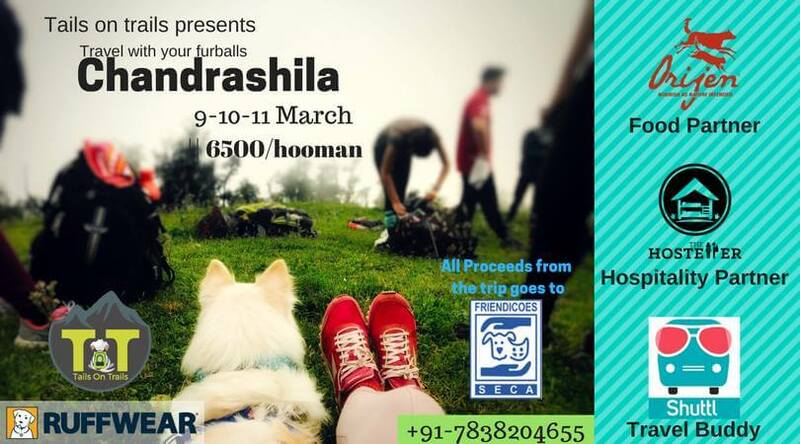 As you know Tails on Trails is back with its second edition - The Deoriatal Chandrashila Peak Trek, we are excited to share with you our travel plan, made especially for you and your furball keeping in mind the feedback received after our first trek. We are going to ensure that you have an amazing weekend. Moreover, a snow surrounded Holi sounds fun, isn’t it? Your furball is special for us too. So, we have pre-medical checkups already lined up for your pet. Along with this, we will send you a personalized diet plan for your dog after knowing his allergies and general food routine. We will have an exercise plan as well that will prepare him physically and mentally for the beautiful experience he’s going to encounter. 9:30 pm: We will leave from Delhi for Haridwar (222 km) in AC buses. There will be no cages for your dogs. We have volunteers and dog behaviorists traveling along to take care of their utmost comfort and needs. 4.00 am: We will reach Haridwar, the city presenting a kaleidoscope of Indian culture. We will rest here for some time. Apart from that, we will provide light breakfast for you and your dog. 5:30 am: After a refreshing break at Haridwar, and with the sun ready to rise, we will leave for our next stop- Ukhimath (202 kms). The whole journey is scenic that will provide you stunning views of rivers flowing and sun peeping from the mountains. The journey is designed keeping in mind proper breaks for the dogs. 3:00 pm: We reach Ukhimath, a small town in Rudraprayag district, Uttrakhand. With lots of temples around, we are sure you will be filled with great energy to start the trek!! 3:30 pm: A tiny village with only 100 houses, a small school and a lot of greenery, all this best describes our next point - Sari. This is the place from where we will start a 2.5 km trek to Deoriatal, our first base camp. Keeping in mind your comfort, all the luggage will be transported directly to the next base camp, and hence you can trek easily with just your water bottle and dog food! 5:30 pm: As we reach the base camp, you will have almost an entire evening to yourself. Go around and explore the trails with your pet or watch the chirping Himalayan birds with the background of snow-capped Himalayan mountains. Singing and dancing together around the bonfire under the stars is the best experience to embrace after a day of travel! 6:00 am: As the sun rises and clouds get a little clear, we will start our trek to Chopta. It’s a long trek of 14 km with a series of gradual, and sharp ascents and descents. We will also have a bus departing from Sari to Chopta, and you will always have the bus to your rescue - Yes!! You can choose to take the bus or walk. On the way, you can see Kala Parvat below which is the famous glacial lake called Bisuri Tal. Then you have Rohini Bughyal surrounded by forest and mountain peaks. The view along the trail cannot be described in words. To make it absolutely comfortable for you and to give you an opportunity to enjoy with your pet, the luggage will be transported via bus, and you just have to carry your bottle and doggo treats. 3:00pm: We will finally reach Chopta where you can enjoy a hot meal while witnessing a beautiful sunset as well. Camping amid the Himalayan peaks and surrounded by green lush meadows, Rhododendron and Deodar trees, you can rest here with your pooch. 6:00 am: After a light breakfast, we will depart for the Chandrashila Peak before sunrise to see Tugnath temple, which will be an awesome sight. The sights on the way are incredible as you reach the Chandrashila Peak all covered with snow. Since the ascent is quite sharp on the way, you can choose to skip this part and enjoy noon with your furballs instead. 12:00 noon: After imbibing wonderful vibes of the snow-covered mountains and beautiful temples, we will leave from Chopta. The return journey will give you nostalgia as you cross Sari, Ukhimath, and then Haridwar. We are sure that singing all along the way will make it quite difficult for you to be back to your 9-5 job the next day!! But this break will be the best time you’re going to spend with your little one!